Common Sense – 1776, revised. Note: Recently I posted the entire text of Common Sense. This was a nistake. Some readers told me the article automatically went into spam. Therefore I am re-posting only Paine’s introduction to the original addition. My hope remains however, that people will read Common Sense, the book that more than anyother written material, emboldened the colonialists to think differently about their state of affairs and act. R.E. Government even in its best state is but a necessary evil; in its worst state an intolerable one. 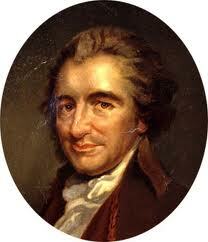 Thomas Paine, Common Sense. We can have democracy in this country, or we can have great wealth concentrated in the hands of a few, but we can’t have both. Chief Justice Louis Brandeis. Perhaps the sentiments contained in the following pages, are not yet sufficiently fashionable to procure them general favor; a long habit of not thinking a thing wrong, gives it a superficial appearance of being right, and raises at first a formidable outcry in defence of custom. But the tumult soon subsides. Time makes more converts than reason. As a long and violent abuse of power, is generally the Means of calling the right of it in question (and in matters too which might never have been thought of, had not the Sufferers been aggravated into the inquiry) and as the King of England had undertaken in his own Right, to support the Parliament in what he calls Theirs, and as the good people of this country are grievously oppressed by the combination, they have an undoubted privilege to inquire into the pretensions of both, and equally to reject the usurpation of either. Thanks for that Robin. It made me think of the wonderful common sense writings of Emerson.